JNN 20 July 2014 Damascus : Militants from the so-called Islamic State of Iraq and the Levant (ISIL) terrorist group have massacred 270 Syrians since capturing a gas field in Homs province, most of whom were executed, a pro-opposition Observatory group said. The so-called Syrian Observatory for Human Rights said on Saturday it had documented “the death of 270 people killed in the fighting or executed” since the ISIL militants seized the Shaar field in central Syria. “A large majority of the men killed were executed at gunpoint after being taken prisoner following the takeover of the camp,” said Observatory director Rami Abdel Rahman. “Eleven of the dead were civilian employees, while the rest were security guards and National Defence Force members,” he added. On Saturday, Syrian forces, a day after launching a counter-attack, had “re-taken large areas of Shaar”, Abdel Rahman said. “Fighting is continuing around the gas field”. 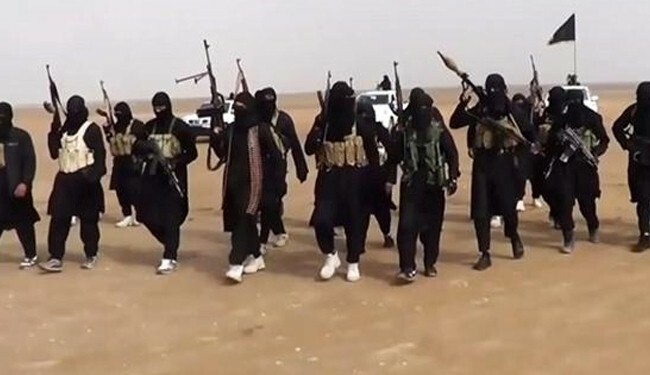 The counter-attack had left at least 40 ISIL militants dead said the Observatory. Gruesome footage recorded by the ISIL militants at the gas field and distributed via YouTube showed dozens of bodies, some of them mutilated, strewn across a desert landscape. One video shows an ISIL militant posing with the bodies as he speaks in German Mixed with religious terms in Arabic, seemingly celebrating the killings. This entry was posted in Middle East and tagged Abdel Rahman, Executions, gas field, ISIL, ISIS, Islamic State of Iraq, Observatory, Rami Abdel, Syria, Syrian Gas Field, Syrian Observatory for Human Rights, Terrorists, the Observatory. Bookmark the permalink.